This heavenly alignment of the World’s Tallest Water Sphere and the Sun was photographed and submitted by reader Brian Donahue in February of 2010. The photo is taken from Route 78 in the Hillside area looking west. 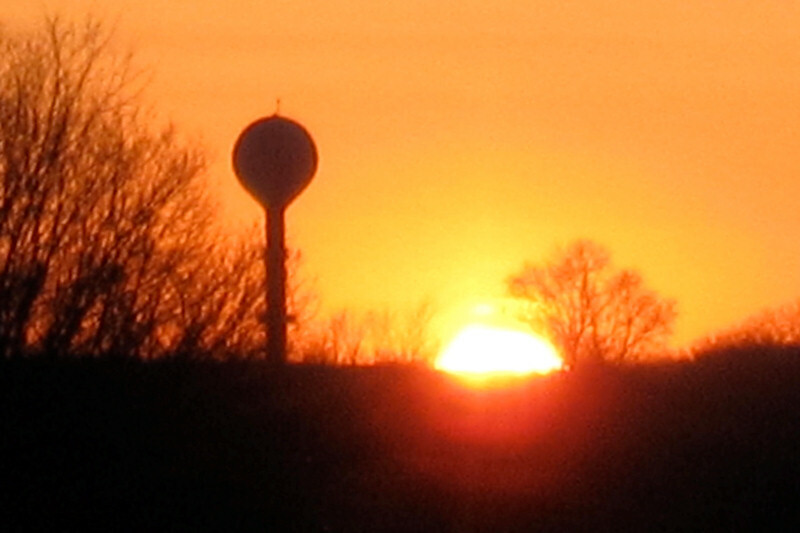 As several readers have mentioned, there is an alignment of Sphere and Sun during two moments during the year when the Sun’s elliptical declination aligns perfectly behind the water tower. Can other readers guess what these dates are and the significance to the builders? One clue is that this photo taken in February is close to the date but not precisely aligned. Another clue is that there has been one moment in time when the Sun has been eclipsed by the Moon and the Moon has been eclipsed by the World’s Tallest Water Sphere. This entry was posted on Sunday, February 28th, 2010 at 11:30 am	and is filed under Art, Photos. You can follow any responses to this entry through the RSS 2.0 feed. Both comments and pings are currently closed.